You’re looking back and forth between the stellar resumes of two star applicants. They both have the right skills and experience, and they likely both interviewed well if they made it this far. You have two equally qualified candidates, but you can only choose one. It’s an enviable position to be in, but it’s still an important decision, and it’s always hard to let a great candidate go. Here’s our advice on how to make the right hire when you’re trying to decide between two job candidates. When both candidates fit the job description and all your short-term requirements, you may be able to make the decision more clear by broadening your scope. Think about how each person is likely to grow and contribute to the company beyond the requirements of their job title. Maybe one of them has great leadership potential. Maybe one of them has shown an incredible ability to innovate at past jobs. Maybe one of them showed more enthusiasm, not just for the industry, but for your company. Compare candidates’ track records with your company’s needs. It can be helpful to look at their past promotions too. How quickly have they been promoted at past jobs? Why were they promoted? These are good questions for your candidates and their references. 2. Ask the right tiebreaker interview questions. Hanging your decision on one tiebreaker question may not yield the best outcome, but asking the right questions will often give you the additional information you need to make a decision, and your candidates’ answers might surprise you. What made you choose to leave your last job? How have you changed in the past five years? What is your most important long-term goal? What are your short-term goals? What is your favorite job you’ve ever had and why? No matter which questions you choose to ask, it’s important to ask each candidate the same ones. Consistency in interviewing is key, and you’ll be able to compare answers across the board. It’s also worth asking questions that are harder to prepare for, including behavioral questions, like how they’ve handled specific difficult situations in the past. Consider bringing in the candidates’ potential future team members to assist you with the interviews, and spend some time talking as a group after each candidate leaves to hear everyone’s thoughts. 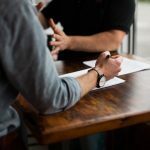 It’s also important to coordinate with team members before an interview, to ensure all members know to follow the correct legal guidelines for what questions they can and can’t ask. Tip: Check in afterward with every person the candidate met when you weren’t around. If a candidate wasn’t polite to office assistants, interns, or people at the front desk, it could be a red flag. 3. Assess company culture fit and soft skills. Hiring for culture fit is extremely important. The problem is that gauging someone’s compatibility with your company’s social environment isn’t usually as straightforward as ticking off skills and requirements from their resume. Spend some time thinking about each candidate’s values, collaboration style, and personality. Do they match up well with your company’s culture? Even a highly skilled candidate can struggle in an environment that doesn’t match their temperament. For example, a non-assertive person who values collaboration and harmony may not fit in well at a highly competitive company where employees succeed through individual achievement. Some companies even take potential new hires out for coffee or happy hour with the team to get a sense for how well they might get along with their potential future coworkers. Keep both candidates engaged while you decide. Having two excellent candidates can sometimes lengthen the hiring process, especially if you need to schedule additional interviews. When this happens it’s important to do what you can to keep both candidates engaged. If a candidate loses interest or gets frustrated by a long recruiting process, they may end up removing themselves from contention and making your decision for you. Transparency can also be beneficial for both parties throughout the process. This can mean asking the candidate if they are in an active search and if other potential opportunities have been presented to them. This way you can gauge the urgency of their job hunt and be sensitive to their situation. You also don’t want to burn any bridges with the candidate who doesn’t make the cut. If you leave them with a great impression, they may still be interested in other future opportunities with the company. Even more importantly, if your top choice turns out to not be the right fit, you want to be able to quickly hire your second choice. Improve your hiring process and mitigate risk with professional HR services. Rush Recruiting and HR provides award-winning services to help you attract, select, and onboard the best possible employees. We excel at all the most difficult aspects of hiring, including writing great job descriptions, determining culture fit, conducting behavioral interviews, and more. Contact Rush Recruiting & HR today to learn more about how we can help you.